Sent off as the 5-2 second favorite, following a three and one-quarter lengths win in his All American trail, Apocalyptical Jess broke sharply to win the $3 million All American Futurity wire-to-wire by three-quarters of a length over second-placed Im Jess Special V. No Mires A La Luna was another nose back for third. Raul Ramirez Jr. rode Apocalyptical Jess over the 440 yards in :21.393 to take the 60th running of Quarter Horse racing’s showcase event. Owned by Bill Robbins, Apocalyptical Jess gave trainer Blane Wood his first All American Futurity win. Blane Wood and his father Leo are the only father-son pair to have both won the All American Futurity. Leo Wood won the 1979 All American Futurity with Dan and Jolene Urschel’s Pie In The Sky. Im Jess Special V, a gelding by Jess Lips, had placed fifth in the $1 million Ruidoso Futurity and was second in his All American Futurity trial. Agustin Silva was aboard Im Jess Special V for trainer Toby Keeton and owner Valeria Racing Stables. Maiden gelding No Mires a La Luna, by First Moonflash, was sent off by trainer Trey Ellis for owners David Valdez and Bryon Woodard and ridden by Rodrigo Sigala Vallejo. Rainbow Futurity winner Mm Fourinthemorning, the 7-5 favorite finished fifth. The Ruidoso Super Select Yearling Sale’s three-session run concluded on Sunday night with an average of $46,580 – an 8.7% increase over the 2017 offering. The Sunday night session averaged $51,739 – a 12.2% increase over the final night of the 2017 sale. Leading the sale and the Sunday night offering, at $340,000, was Good Candy P, a son of Good Reason SA, out of a stakes-winning half-sister to champion and All American Futurity winner Jess Good Candy. Jess Good Candy, the undefeated career earner of $2,014,703, is also sired by Good Reason SA. Good Candy P was consigned by Lazy E Ranch LLC, agent for Michael Pohl, and purchased by Don Cavenaugh, who also bought A Sweet Jess, half-brother to world champion One Dashing Eagle, for $300,000 on Friday, in Session 1. Also selling in Session 3, on Sunday night, were three yearlings that each brought $230,000, as well as eight yearlings that brought at least $200,000 each. Jessafamouslady, consigned by Grant Farms LLC, sold for $230,000 on a bid from Reliance Ranches LLC. The Mr Jess Perry-sired filly is out of Famous Corona Lady, the dam of Ruidoso Futurity third-place finisher Jest Famous. Jess Sumokin Hot, consigned by Roger Day, agent for Corner K Quarter Horses, also brought $230,000. The Apollitical Jess son is out of stakes winner and stakes-winning producer Sumokin, a half-sister to 2018 Ruidoso Futurity winner Blue Corazon, and was purchased by Paragon Farms LLC. The third $230,000 yearling, Mr Tres Points, a son of Mr Jess Perry out of multiple stakes winner Tres Of Linda, was consigned by Lazy E Ranch, agent for McColee Land and Livestock, and purchased by Newman Cattle Company. The opening session of the Ruidoso Select Yearling Sale saw A Sweet Jess, a half-brother to World Champion One Dashing Eagle, bring the top price of $300,000. Consigned by Roger Daly, agent for Allred Bros. Ranch, and purchased by Don Cavenaugh, Walnut Ridge, Ark., A Sweet Jess, by AQHA World Champion Apollitical Jess, is a half-brother to World Champion One Dashing Eagle, out of One Sweet Dash, dam of 11 winners from 17 starters. Cavenaugh also paid $90,000 for Three Fancy Socks, by PYC Paint Your Wagon. Mr Jess Perry sons Mr Ricks and Jess Different brought $240,000 and $220,000, respectively, the second and third highest prices from the session. Mr Ricks, out of stakes winner and stakes producer Aquafina, was consigned by Lazy E Ranch, agent for McColee Land & Livestock, LLC, and purchased by Reliance Ranches, Guthrie, Oakla. Jess Different, purchased by Dillon Lane, shares the same second dam, Broodmare of the Year Runaway Wave, as Mr Ricks, and was also consigned by Lazy E Ranch, agent for McColee Land & Livestock, LLC. The Ruidoso Select Yearling Sale resumes on Saturday evening, September 1, following the races; the third and final session is on Sunday, September 2. 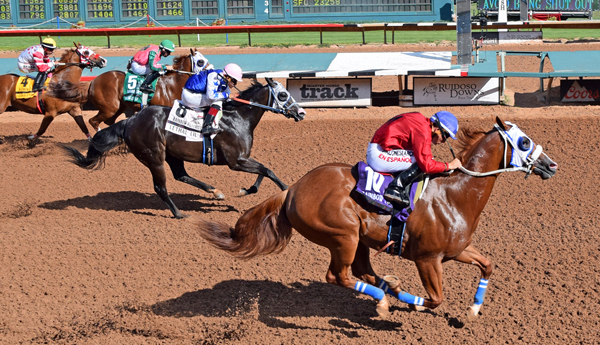 Mm Fourinthemorning, 2018’s top 2-year-old Quarter race horse, leads three runners from Blane Wood’s stable in the $3,000,000 All American Futurity on Monday, September 3 at Ruidoso Downs. The Labor Day program also includes the $200,000 All American Juvenile and concludes the Quarter Horse season at the famous New Mexico track. 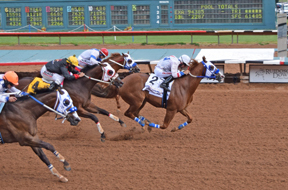 The 440-yard All American Futurity pays out the largest purse in Quarter Horse racing. The finalists were determined through two days of 440-yard trials, with 16 trials held each day. Horses with the five-fastest times from each day advanced to the All American Futurity. Horses with the next five-fastest times from each day are eligible to race in the All American Juvenile. Mm Fourinthemorning vaulted to the top of the American Quarter Horse two-year-old division with an eye-catching victory in the $1,000,000 Rainbow Futurity in July. Starting from the outside post position — the same post position he drew for the All American Futurity — Mm Fourinthemorning won the 400-yard Grade 1 stakes race by three-quarters of a length in an ever widening pace, suggesting the 440-yard All American Futurity would suit his running style. The Mr Jess Perry gelding, owned by his breeders Mark and Annette McCloy, later proved his 440-yard ability in the All American Futurity trials, where he rolled to an easy two-and-one-quarter-length win at odds of 1-9. Mm Fourinthemorning is the 3-1 morning line favorite. The two other Wood-trained runners are Apocalyptical Jess, the 7-2 morning line second choice, and Badhabit Jess at 12-1. Apocalyptical Jess, a gelding sired by Apollitical Jess and owned by Bill Robbins, could be especially dangerous from his number two post position. Although he had trouble at the start his Rainbow Futurity trial and came away racing behind horses, Ramirez was able to take him to the outside, move him around horses, and rally to grab second-place, beaten only by a neck. In his All American Futurity trial, Apocalyptical Jess got an excellent start from the inside post position and ran down the rail to win by three and one-quarter lengths. He stopped the clock at :21.349, the top time on the first day of trials. Raul Ramirez Jr. will be aboard Apocalyptical Jess on Labor Day. La Feliz Montana Ranch’s Badhabit Jess, a $25,000 Ruidoso Select Yearling Sale purchase, starts next to Mm Fourinthemorning in the ninth post position. The Mr Jess Perry gelding will be ridden by Hall of Fame jockey G.R. Carter Jr.
Badhabit Jess broke his maiden in his fourth start, when he won his All American Futurity trial by a head. He placed second in his Ruidoso Futurity trial and fourth in his Rainbow Futurity trial. In the All American Juvenile, J & SM, Inc.’s Rustys Miracle is the solid 2-1 morning-line favorite. The $61,000 Ruidoso Select Sale Yearling purchase comes to the race off of a three-race winning streak. Trained by Fred Danley, Rustys Miracle started the streak with a victory in her Rainbow Futurity trial, then won the $100,000 Rainbow Juvenile by one-half of a length. The daughter of Valiant Hero won her All American Futurity trial by a neck with a :21.695 time. Sent off at odds of 8-1, MM Fourinthemorning drove clear from post position #10 to win the $1,000,000 Rainbow Futurity wire-to-wire by three-quarters of a length. Ridden by Ricky Ramirez for trainer Blane Wood, the gelded son of Mr Jess Perry covered the 400-yard distance in 19.537. Lethal Lil, with Jose Alvarez, finished second, and Flying Cowboy 123, under Raul Ramirez, placed third. Suze Returns, the 6-5 favorite, who finished as runnerup in the $1,000,000 Ruidoso Futurity, drifted in at the start from post position #3 and finished eighth by three and three-quarters lengths. 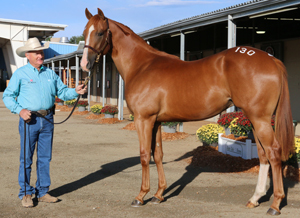 MM Fourinthemorning, a $50,000 Ruidoso Yearling Sale graduate, owned by Mark and Annette McCloy, Tatum, New Mexico, won his Rainbow Futurity trial in 19.887, after finishing seventh in his Ruidoso Futurity trial, his only other start. 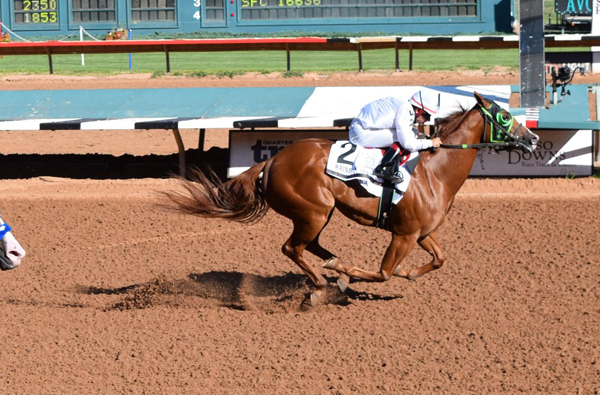 Lethal Lil, ridden by Jose Alvarez for trainer Joel Valeriano, Jr., won her Rainbow Futurity trial by one and one-quarter lengths and had previously qualified for the West Texas Futurity. The Corona Cartel filly out of Lethal Delight, is a half-sister to 2014 All American Futurity winner JM Miracle, �and owned by La Feliz Montana Ranch. Flying Cowboy 123, sired by Apollitical Jess and half-brother to world champion Cold Cash 123, was a $100,000 Ruidoso Select Yearling Sale purchase and is owned by Paragon Farms, Conroe, Tex. Political Attraction, trained by Josue Ponce for Rogelio Marquez Jr. and Kathy Robinson, Claremore, Okla., survived an extended inquiry and rider’s objection to win the $750,000 Rainbow Derby by one length over Hes Limitless. Ridden by James Flores, the 8-5 favorite covered 440 yards in :21.092, the fastest time of the current meet. The inquiry and an objection by Papaws Paint�s rider Bonifacio Perez was raised because at one point Political Attraction moved close to Papaws Paint. But an isolation shot from a video camera showed that Political Attraction never touched Papaws Paint. A gelded son of Apollitical Jess, Political Attraction, winner of the $283,000 Black Gold Futurity and the $214,000 Speedhorse Futurity, was a $40,000 supplement to the Rainbow Derby, which paid $336,657 for his win. Runner-up Hes Limitless, a gelding by Corona Cartel, was making his first stakes appearance since finishing fourth in the $3,000,000 All American Futurity last September. The John Stinebaugh-trained gelding, ridden by Agustin Silva, is owned by Jack Smith Farms, Comber, Ontario, and also finished second in the $100,000 Rainbow Futurity Juvenile. Papaws Paint, a gelding by Pyc Paint Your Wagon, trained by Todd Fincher for RH Resources, Graham, Tex., won last fall�s $202,000 Hobbs America Futurity. Jess Move You, winner of the $795,000 Ruidoso Derby on June 9th, was sent off at odds of 7-2 in the Rainbow, but finished seventh following a poor start. Triple Crown winners Mike Smith and Justify. 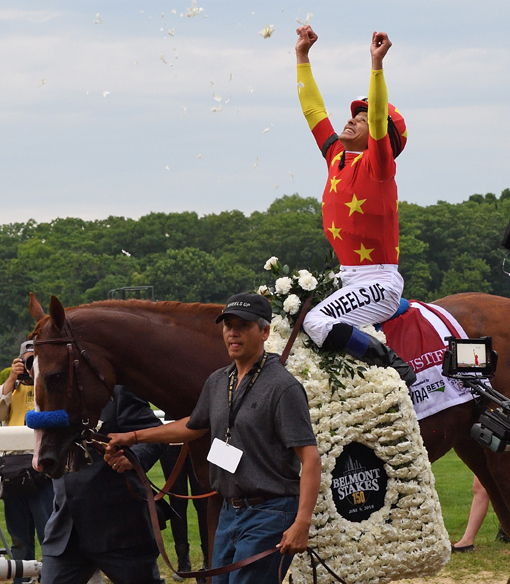 Triple Crown winning jockey and New Mexico native Mike Smith will make a celebratory appearance at Ruidoso Downs on July 8 and lead the post parade for the seventh race. 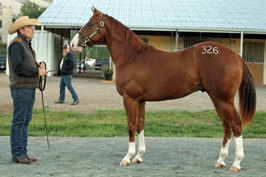 Born in Roswell, NM, Smith won this year�s Kentucky Derby, Preakness and Belmont Stakes on Justify, the 13th Triple Crown winner in Thorouhbred racing history. At 52, the oldest jockey to win the Triple Crown, Smith mentioned Ruidoso Downs while Justify was returning to the Belmont Park winner�s circle. �He left (the gate) like he was at Ruidoso going 440 yards.� said Smith, who was also the primary rider for the famous champion mare Zenyatta and the all-time leading money earner Arrogate. Raised on a farm outside of Dexter, NM, Smith was riding in Quarter Horse match races by the time he was 11. In 1982, he acquired his jockey�s license and recorded the first win of his career at The Downs at Santa Fe. Known at �Big Money Mike,� for his success in the world�s premier races, Smith has won the Kentucky Derby and the Preakness twice, the Belmont three times, and captured a record 27 Breeders� Cup wins. He has also won the Irish 2,000 Guineas and the Dubai World Cup. The winner of 5,400 over races and $313 million, Smith had his best year in 2017 when his horses earned $20,540,871 with an average earnings per start of $74,694. His one official start on a Quarter Horse was in 2002, when he finished finished third in the $156,800 El Primero Del Ano Derby at Los Alamitos, on Check Him Out. �Mike is a global celebrity and we are honored by his willingness to come to Ruidoso Downs to share his Triple Crown celebration with us,� said Ruidoso Downs president and general manager Jeff True. �He is a wonderful ambassador of our sport and he never forgets where he came from. Custom made posters of Smith winning the Belmont Stakes will be for sale at Ruidoso Downs on July 8, and Smith will be on hand for a special autograph signing session, where he will personally sign 100 posters. All proceeds for poster sales will go to the Permanently Disabled Jockey Fund.